I’ve been testing these cupcakes for a bit now, trying to get the flavors/texture just right. The goal has been a cupcake without a bunch of refined sugar that tasted as though you were biting into a chai latte and I think I’m there. I tried to make these work with using only chai tea but the cupcakes came out more “I think if I close my eyes and imagine, I taste chai.” So in came the spices paired with black tea and that made all the difference. Preheat oven to 350˚ and line a muffin tin with 6 liners. In a bowl, combine flour, baking soda, baking powder, and sea salt. In a separate bowl, whisk eggs then add to dry ingredients along with the cooled chai mixture. Stir until batter is just combined. Divide batter into the muffin tin and place in the preheated oven. Bake for 18-20 minutes until muffins spring back when pressed and a toothpick comes out clean when entered into the muffin. Remove from oven and let cool for 5 minutes. Transfer muffins out of the tin to a rack and finish cooling. Once muffins are cool, using a hand mixer, stand mixer, or arm muscle/whisk, beat heavy cream until it can form stiff peaks (but not breaking apart). Whisk in maple syrup. 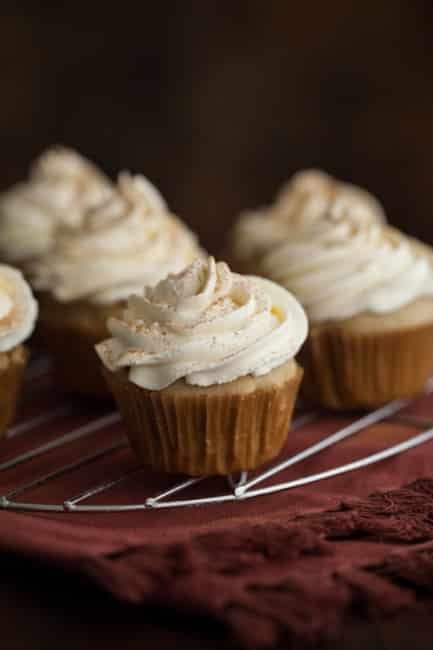 Spread or pipe the whipped cream onto the cupcakes and sprinkle with a bit of cinnamon to serve. *I tend to make cupcakes in smaller batches but this recipe can easily be doubled for an even dozen cupcakes! These sound absolutely delicious. Perfect autumn treat! Good luck with all the hosting changes, I’ve dealt with that and it was a major pain! Things look good from this end though! Mmm such a fabulous flavour. That whipped cream looks awesome too! Oh man, I can’t WAIT to make these. Chai is my favorite! Oooo there is nothing better than a hot chai latte on a cold day! These are so pretty! We have new neighbors that moved in and I might make these for them as a welcome to the neighborhood gift! I would like that maple whipped cream on everything I eat from now on! The site is looking great to me!! Ohhhh chai flavors how i love thee. They get me through the winter. Would it be overkill if I dipped these into a chai latte? Hello! These are my kind of cupcakes. 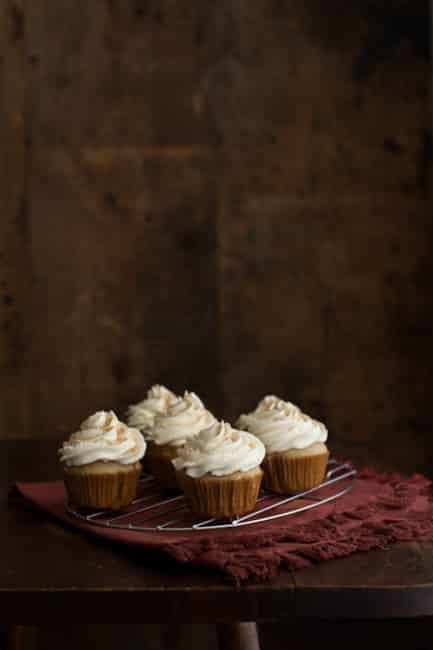 How did you get whipped cream to stand so pretty and tall on those cupcakes? And have you tried coconut cream yet? I’m obsessed. I’ve been wanting to try more chai recipes since last fall and haven’t done it. I thought a chai pudding would be fun. Any thoughts?? I understand the desire for frosting but the whipped cream makes it more latte-esque! These sound amazing…they’re definitely going on my “make this soon” list. This sounds so amazing! I am usually not a Cupcake or Maple fan but The combination of the flavors sounds so delicious! Will definitely make my first Cupcake soon thank you! Wow! I love chai and I love cupcakes- perfect! Can’t wait to try them! 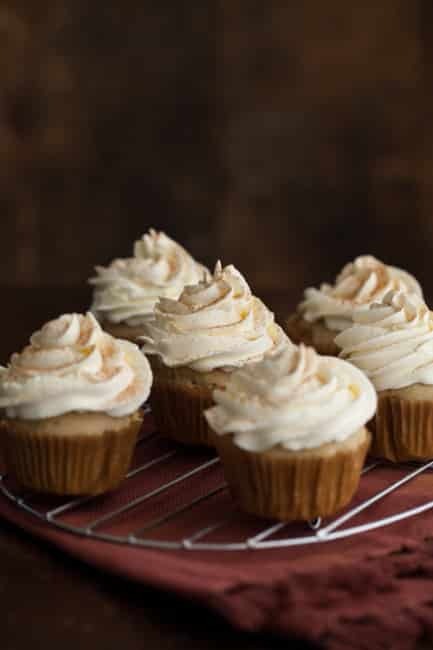 These are lovely – I can’t cope with a ‘proper’ cupcake any more but these sound right up my street especially with that whipped maple cream topping. Thank you so much for this recipe, I just made these and they were delicious! 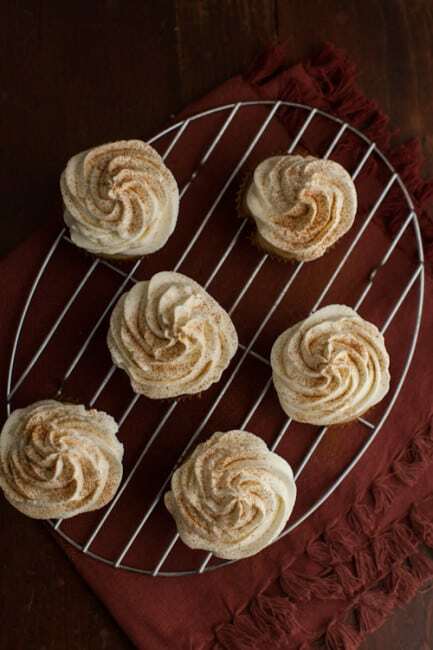 The cream give a much lighter flavour than regular cupcake frosting. I love anything chai so I’m definitely going to make these! My goodness, these looks amazing! I can’t wait to try them out. Chai is my favorite this time of year! this was absolutely gorgeous! we quadrupled the recipe and made it as a layer cake. it was completely devoured at a birthday party last night, and highly praised. thanks for the beautiful recipe! Thats what I wanted to do. Any advise before I do it? Sounds yum. Can anybody advise on if I can make this into one big chai latte cake for birthday (Suprise for a Chai latte loving person)… look fwd to hearing from you. Hello! I believe if you double the recipe and use two 8″, well greased cake pans you should be fine (and adjust the baking time to be slightly longer (my guess would be closer to 22-24 minutes, but it should still spring back when done.) Hope this helps! I was thinking about making these for a picnic. Do I need the star anise? It’s not absolutely necessary but it adds a nice touch.